Although ECG signals have been the gold standard for heart rate variability (HRV) due to the sharp, easily identified peak of the R wave, there has been a desire amongst researchers and practitioners to find a more convenient alternative. The pulse sensor, of the kind seen in hospitals attached to patients’ fingers or toes has long thought to have had the potential to deliver pulse measurement accuracy sufficient for HRV. Studies have reported good correlations between medical grade pulse sensors and ECG especially in resting positions. Recently, a comprehensive review of 30+ studies in the International Journal of Cardiology by Schafer and Vagedes concluded that ‘Results speak of sufficient accuracy when subjects are at rest’, though they did issue cautions regarding use of pulse sensors during exercise due to motion artefacts. 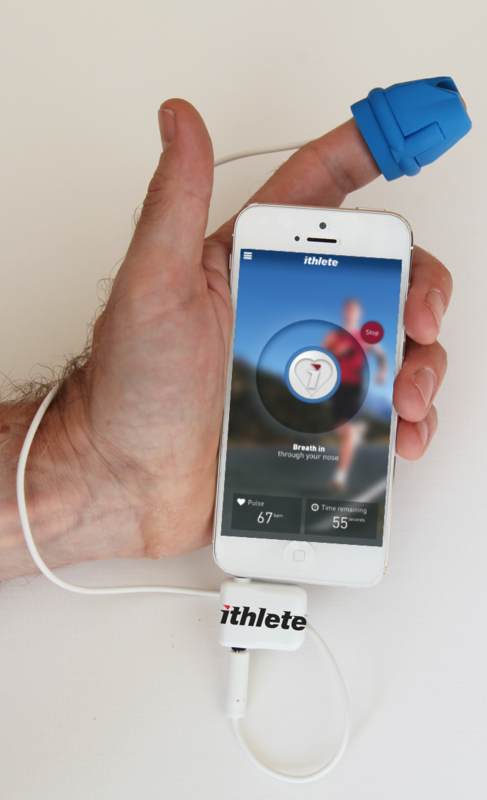 HRV Fit Ltd (the parent company of ithlete) developed a pulse sensor in conjunction with a German health services company that could work directly with Apple and Android smartphones, and which had medical grade performance but at consumer price point and ease of use. We were also introduced to the leading psychophysiology research department at Sydney University and in particular to HRV researcher James Heathers, who was looking for a way to scale up the number of subjects in his studies at affordable costs, without losing measurement accuracy. James kindly agreed to validate the ithlete Finger Sensor, and his findings were published recently in the International Journal of Psychophysiology. James’ initial validation was conducted with 10 healthy male & female subjects between the ages of 21-30, who all had simultaneous ECG recordings performed whilst sat at rest for 10 minutes, with the last 5 minutes data being compared between the pulse and ECG sensors. The R wave peak coincides exactly with the contraction of the large muscle ventricle walls of the heart. This is the contraction that squeezes blood rapidly out of the aortic valve through the arteries and around the body. The pulse is detected when the wave of blood arrives at the finger tip about 1/3rd of a second later (depending on the length of the arm). The precise amount of time depends also on the tension of the artery walls and the air pressure in the chest. Both of these vary with breathing. The good news is that the variation in pulse transit time (as it is known) is relatively minor, and that it causes a predictable change. To put the findings in context, an average exaggeration of 5% is equal to 1 ithlete unit, and since ithlete warnings and trends are all relative to the moving average baseline, there is no impact on validity of ithlete readings. When making the transition from ECG (chest strap) to finger sensor, you may find your baseline rises a little. 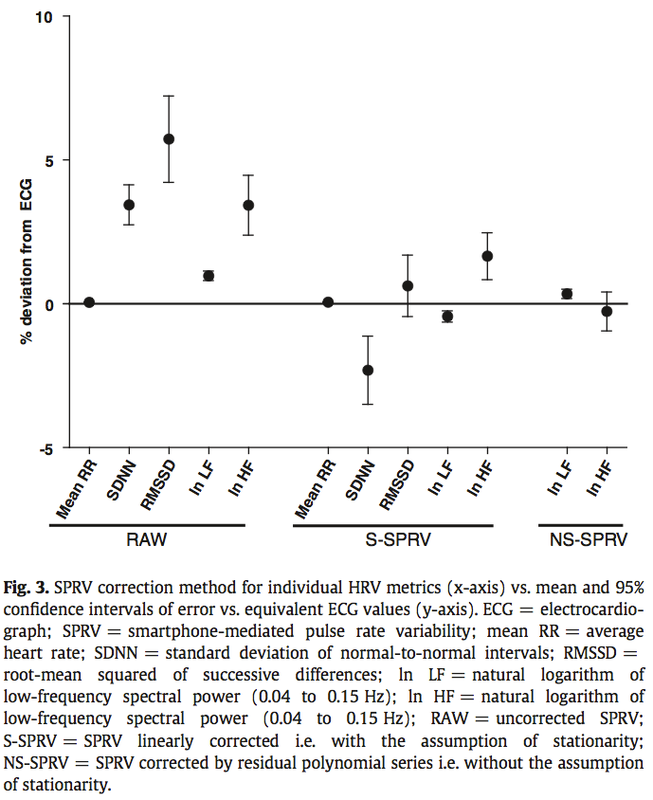 On the other hand, tests we have done on fit people with high HRV have shown essentially no difference between chest strap & finger sensor ithlete measurements performed at the same time.